Carved , Hollowed , Perforated , Polished? L = 325, proximal end diam = 11.5, finger-hole W = 6; embouchure diam = 18 by 15; bell mouth L = 53, W = 42.7, opening W = 44 mm; L from fingerhole to embouchure edge = 80 mm [RTS 3/12/2004]. Small side-blown trumpet, carved from a single piece of Topi horn (a type of antelope) and then hollowed out. The body follows the natural curvature of the horn, which has marked horizontal ridging around the body until just before the tip. The instrument has a narrow proximal end with a finger-hole at its tip to control the note; this has a round section and a flat-cut lip. The body then tapers out towards the distal end, where there is a wider bell mouth with an oval section, cut flat at the lip. A sub-rectangular mouthpiece, with convex ends, has been cut into the upper, concave side of the object. The surface is a dark brownish black colour (Pantone black 7C) and opaque throughout. It is essentially complete, but a small rectangular section has been lost from the surface on one side; the exterior is smooth, except where there are shaving marks near the narrow end, and has probably been polished. There are 3 very small, shallow circular depressions bored into the surface in a neat row near this point; these look very precise, and may represent something done to the object after it was acquired by Powell-Cotton. The trumpet has a weight of 234.3 grams, and a length of 325 mm. The proximal end is 11.5 mm in diameter, with finger-hole aperture of 6 mm; the embouchure measures 18 by 15 mm across, while the broad bell mouth of the instrument has an exterior diameter of 53 by 42.7 mm and an internal opening that measures 44 mm across. The length from finger-hole to the edge of the embouchure is 80 mm. Collected by Percy Horace Gordon Powell-Cotton and his wife Hannah at Loronyo on 17th April 1933, during a shooting expedition. Samuel White Baker provided an early description of the Lotuko, in which he stated that dancers participating in funerary dances "wore an antelope's horn suspended round the neck, which he blew occasionally in the height of his excitement" (J.G. Wood, 1868, The Natural History of Man Vol. I, p. 511). Powell-Cotton did not record the Lotuko name for this particular type of horn, or under what circumstances it would be used. Accession Book Entry [p. 248] 1934 [insert] 8 [end insert] - MAJOR P. H. G. POWELL-COTTON , Quex Park, Birchington, E. Kent. Specimens collected by himself & Mrs Cotton, during hunting trips, 1933, viz: [...] [p. 252] - From the LATUKA tribe, NAVERA, TORIT, LARONYO. [p. 256, insert] 88 [end insert] - Side-blast trumpet made from a Topi's horn, with terminal stop. ib[idem] [LARONYO]. (728. Additional accession book entry [p. 255] - 1934.8.88. Number given HLR. l[ength] 33 cms. Card Catalogue Entry - EAST SUDAN Side-blast trumpet made from a Topi's horn, with terminal stop. Embouchure on concave side. (JM) Collected by the donor and his wife during hunting trips, 1933 [no further information on tribal catalogue card; RTS 28/5/2004]. Related Documents File - Typewritten List of "Curios Presented to Dr. Balfour by Major & Mrs. Powell-Cotton. Latuka Tribe". 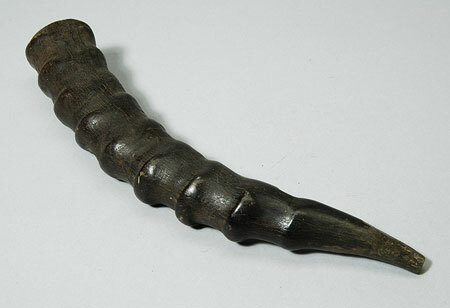 This object appears as item 728: "Topi horn trumpet, 12 1/2, 17/4/33 Laronyo, 4.38 N 32.37 E”. Also contains details of a cine film 'some tribes of the Southern Sudan', taken by Powell-Cotton during this 1933 expedition, copies of which are now in the National Film and Television Archive and the Powell-Cotton Museum in Kent [RTS 14/3/2005]. Old Pitt Rivers Museum label - Trumpet of Topi's horn. LATUKA, LARONYO. E. SUDAN. 4° 38' N., 32° 37' E. d.d. Major Powell-Cotton, 1934 [...] 728) [rectangular metal-edged tag, tied to object; RTS 3/12/2004. Some damage to label surface and label partially rewritten]. Sparks, Rachael. "Lotuko trumpet" Southern Sudan Project (in development). 03 Jan. 2006. Pitt Rivers Museum. <http://southernsudan.prm.ox.ac.uk/details/1934.8.88/>.